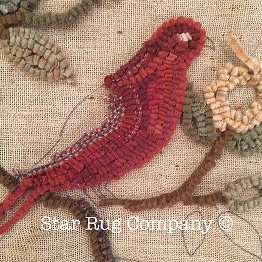 Here you will find primitive and whimsical rug hooking patterns. Whether you are looking for Antique Reproductions, Whimsical Animals or Holiday Themes, Star Rug Company offers dozens of original designs by Maria Barton. Interested in meeting other rug hooking enthusiasts? You can keep up with Maria's schedule by following her blog or visiting her on Facebook. This colorful bird is sitting on Maria's frame, just waiting to take flight! 2016 - Star Rug Company. All rights reserved. Each pattern you purchase is hand drawn straight on the grain upon high quality linen with at least a four (4) inch border on all sides. A color photo of the finished rug is also included for your reference.